This drawing by Dan Crusie of the B&O Railroad in Greenfield, circa 1854, will be used to make 10 prints that will be auctioned off during the Greenfield Rotary Club Auction from 1-3 p.m. Saturday, July 21 at the Greene Countrie Towne Festival. A musician who has been nominated for CMA awards plus one of the country’s top Beatles tribute bands will be the featured entertainment this year at the Greene Countrie Towne Festival in Greenfield, Festival Chairman Andrew Surritt said Tuesday. The festival, sponsored by the Greenfield Rotary Club, will be held July 20-22, although activities will actually start Thursday, July 19 with the queen’s pageant from 7-9 p.m. at McClain High School. Shane Runion, a Portsmouth resident who according to Surritt has twice been nominated for the Country Music Association Emerging Artist of the Award, will be the headline act at 9 p.m. Friday, July 20. The warmup act will be local country musician Sean Poole, who will take the stage at 7 p.m.
Hard Day’s Night, the Beatles tribute band, will be the headline act at 9 p.m. Saturday, July 21. Southern Express will be the warmup act and will play from 5 to 8:30 p.m. The festival will be staged on Jefferson Street and parts of North and South Washington streets, and Surritt said portions of those streets will be closed throughout the festival. The Greenfield Rotary Club Auction, which funds the organization’s community service projects throughout the year, will be held from 1-3 p.m. Saturday. Surritt said donated items are still needed for the auction and can be dropped off at The Letter Shop, 247 Jefferson St., Greenfield, during business hours. If items need to be picked up, call Surritt at 740-572-6737 or Chuck Miller. “It’s really the main fundraiser we have for the club and for all the things we do in the community, like for the hospital, library, band boosters, historical society, maintenance and upkeep on the Recreation Center, and more,” said Miller. “It’s not really a money maker for us, it’s just us trying to do something for the community. One of the auction’s featured items each year is a set of 10 prints from a drawing by a local artist. For the last several years Tammy Wells has provided the drawing, but this year it has been provided by Dan Crusie, a former McClain High School art teacher who provided the drawings for several years before Wells did. This year’s drawing features the B&O Railroad Depot in Greenfield circa 1854, according to Rotary Club member Steve Pearce. 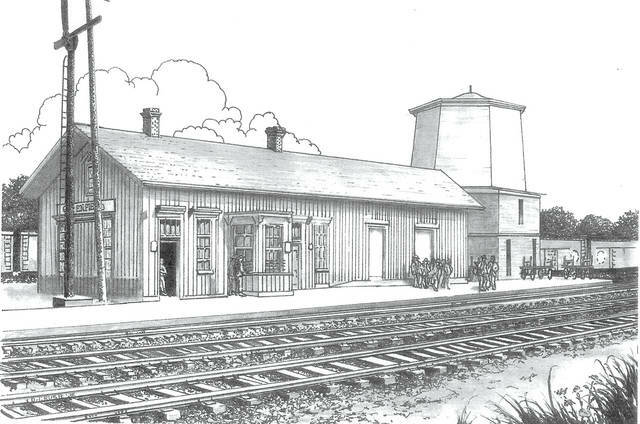 He said the depot has been featured on the prints before, but this year’s version includes a water tower once located beside the depot whose contents were used to provide power for train steam engines. Pearce said that on Feb. 20, 1909, the water tower, which held 58,000 gallons of water weighing in excess of 200 tons, collapsed due to age and neglect, killing Jacob Sultzberger and Boone Cable, two American Pad and Textile Company employees who were unloading freight. The collapse injured several other people. Three or four days before the festival, Surritt said an interactive map of the festival grounds will be posted on its website (www.greenecountrietownefestival.org) so those interested can see where all the vendors are located and events will take place. The festival will also feature a queens’ parade (new this year); grand parade; car show; antique tractor show; craft show; 5K run/walk; midway full of food, games and vendors; and rides for kids of all ages. A full scheduled can be found on the website. “We hope to see a lot of community members there having a great time, and there will be cold beer in the beer garden for those who wish to partake,” Surritt said. The beer garden will be located at Ranchers Roast Beef, 414 Jefferson St., and will be open from around 6 p.m. Friday and Saturday until the festival closes down, according to Surritt. https://www.timesgazette.com/wp-content/uploads/sites/33/2018/07/web1_Auction-print.jpgThis drawing by Dan Crusie of the B&O Railroad in Greenfield, circa 1854, will be used to make 10 prints that will be auctioned off during the Greenfield Rotary Club Auction from 1-3 p.m. Saturday, July 21 at the Greene Countrie Towne Festival.